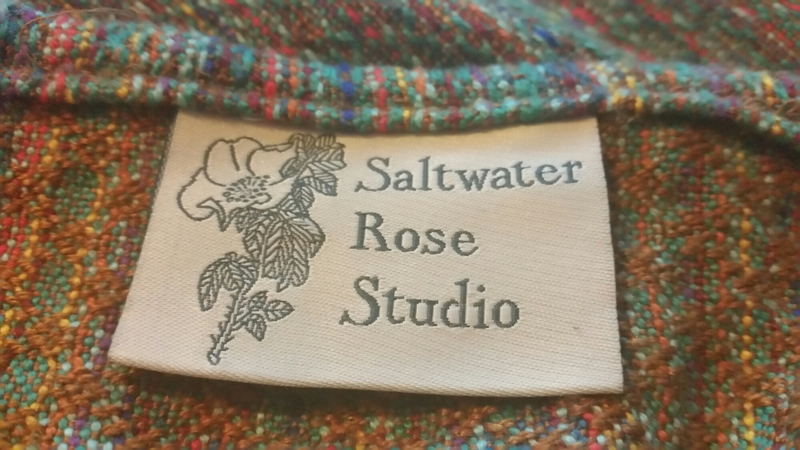 Patina is the first Saltwater Rose Studio wrap I’ve had the pleasure of trying, and having seen pictures of it on the loom I was very much looking forward to having a play and getting a look at those colours up close. Patina has an Egyptian cotton warp, with a copper merino-silk weft. 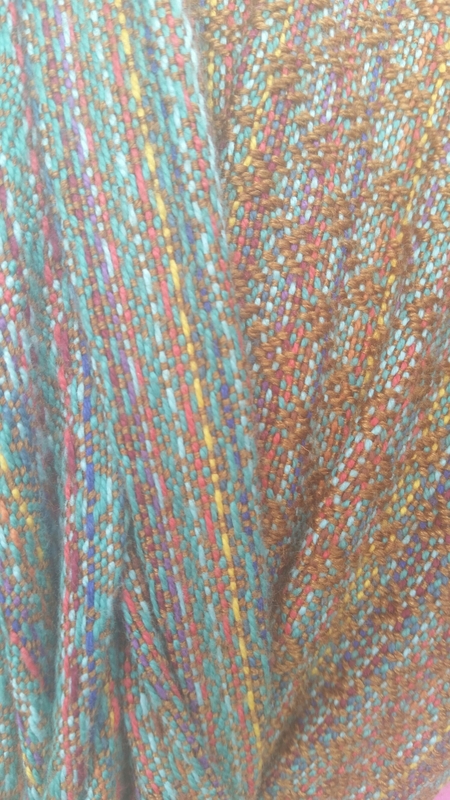 The interplay of the colours Kathleen has chosen are just gorgeous, and the name suits incredibly well. Patina is the name given to the changes in an object, usually antique or aged, as the object ages and the materials oxidize, calcify or encrust. 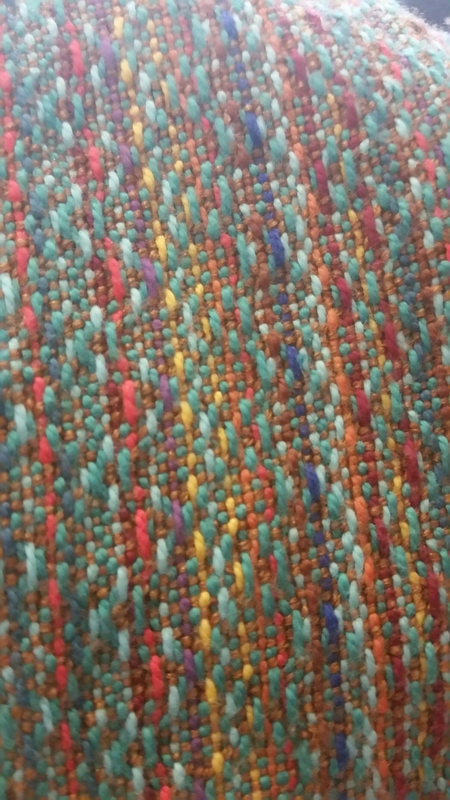 I found this particularly fitting as the twill blend weave structure, combined with the colours, reminds me of the walls of ancient caves on my favourite beach in Cornwall – the striations match the weave structure almost exactly. In terms of craftsmanship, Patina is excellence. The hemming is perfection, and the selvedges are well done. The weave is flawless throughout. 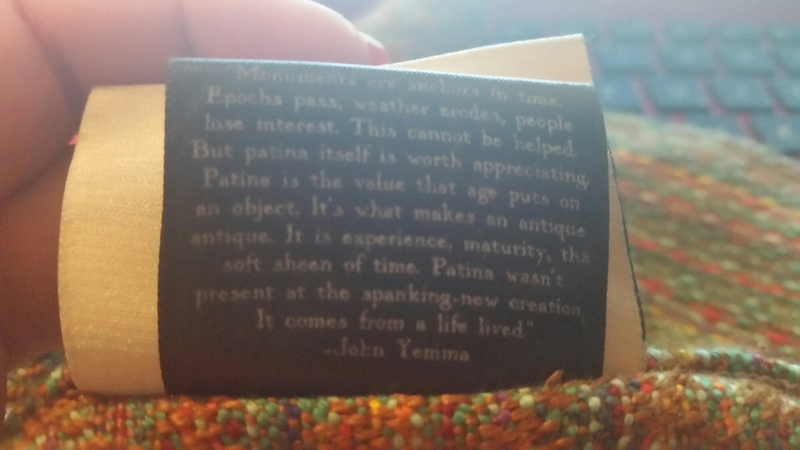 Patina features very classy labelling and a beautiful quote from John Yemma about what patina means. Ok, so we know it’s gorgeous. But how does it feel? How does it wrap? Rest assured, it wraps as good as it looks. I used Patina with a chunky 28 month old in a variety of back and front carries – strangleproof ruck, ruck tied tibetan, double hammock with sweetheart and lexi twist finish, and front cross carry. I found Patina to be pefectly supportive and strong even in a single layer carry – I had no issues with digging on my picky shoulders, regardless of how sloppily I wrapped. Patina has good diagonal stretch and good recoil which means that it moulds well, making wrapping easy and enjoyable. it has good amounts of grip and glide – I am not fighting to make the passes but also they do not slip. Patina holds a double hammockq with a single knot tied under bum well; (and even a *very* sloppy knot tied on tails as seen in the picture above) and I was not worried that it may slip. The double faced texture helps in this regard. 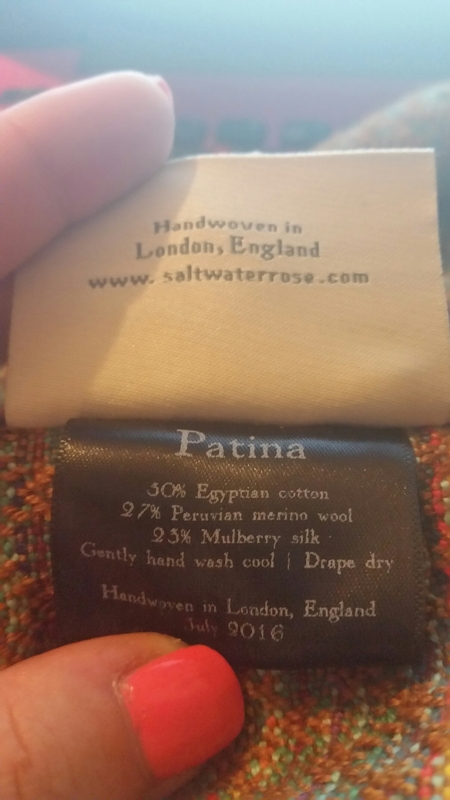 Patina was comfortable equally for long and short carries, the merino and silk working to add strength and cush. All in all, Patina is a work of art and a credit to Kathleen’s attention to detail. It’s a beautiful wrap, with beautiful wrap qualities and I’m delighted to have had the chance to test it. 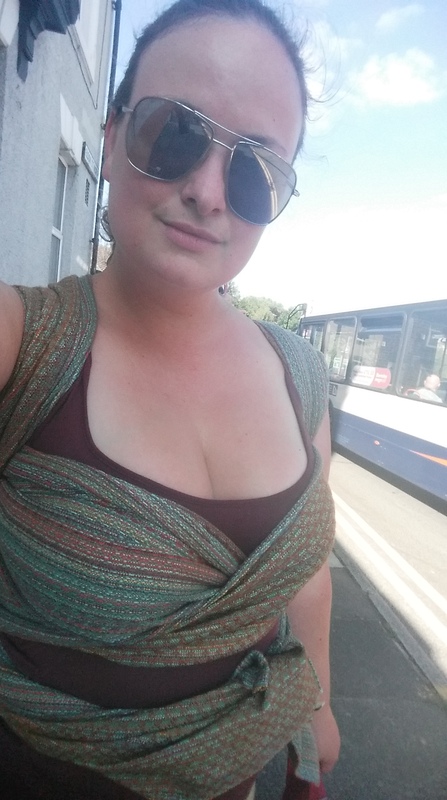 Liora Rae is a new British woven wrap company and Flow is their first offering, which I was lucky enough to be able to test. This tester features lovely shades of teal and blue and is very reminiscent of stylised clouds to me. It’s woven in such a way that the swirls have different textures, and this helps enormously with grip. Flow is a medium weight wrap in hand, with good texture and a very small amount of stretch. It definitely has a hard wearing feel to it; this is a wrap I wouldn’t be afraid to give some use to. It doesn’t strike me as a wrap that will pull easily either. To wear, Flow is very grippy and holds well. I attempted a Double Hammock with a Saltwater finish and found that I didn’t have enough length, to finish in front, so I tied a single knot under bum instead. 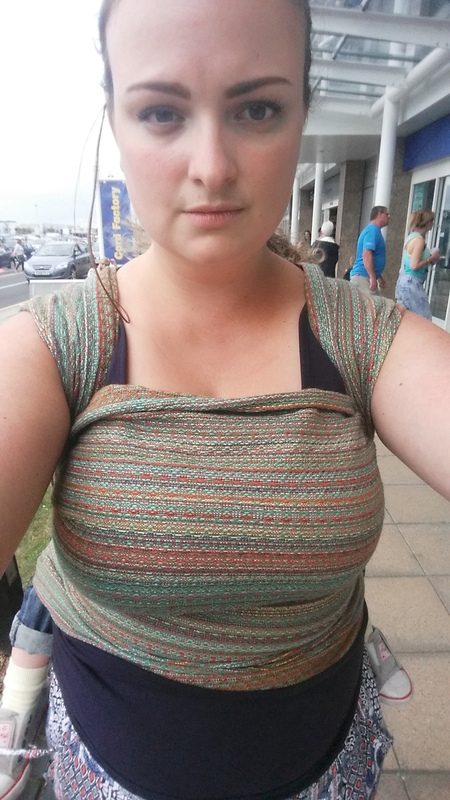 As I was tying on tippy tails and it was behind my back, I wasn’t able to get much tension and so I set off to Asda with some trepidation, fully expecting my poor attempt at a knot to slip. But it didn’t! It held very well, with no slippage despite quite a bit of slack in the passes (my fault, first try at this carry and far from perfect.) I was quite impressed, and this to me was a good testament to the wrap qualities of Flow. 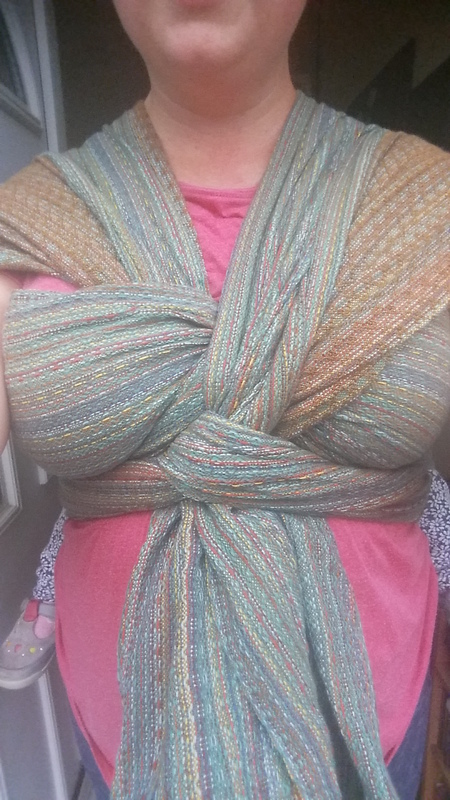 I do think it would benefit from some use and breaking in to help make this wrap softer, , as it isn’t the softest wrap I’ve ever used. But, given time and wear, I think it will get there. I really liked Flow, its’s simple and wrapped well, no fancy blends, no fuss, just a good solid wrap. As an aside, I was very impressed with the quality of the tote and the booklet from such a new company. Natasha has clearly done her research, and the attention to detail and presentation shown here is promising and gives a very good impression.